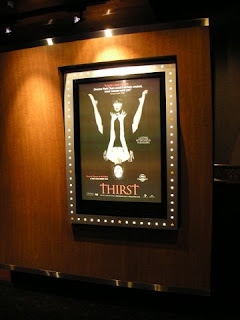 Last Sunday, we headed to Chinatown to see the Thirst. For us, seeing a Korean movie in theatre is a luxury. This movie was controversial among Korean fans, though for me it was a cute(?) vampire story. I like the way the director throws jokes. 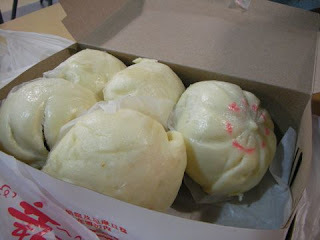 Before the movie, we stopped by New Town Bakery to pick up some steamed buns. I liked spicy pork and pork and vegetable buns. Very simple but good comfort food. Steamed buns always remind me of Korean winter days. Every winter, there were glass warmers for steamed buns (see the picture below) in front of grocery stores. I found this old ad image here. I think it's from 1980s. I don't know who owns the copyright as I found the same picture here and there. Since this image is from an ad, maybe nobody cares? P.S. It is funny that the lady in the picture is now in Vancouver. She is a talented comedian. I ran into her one day and didn't realize it was her. I just thought maybe I knew her as she looked familiar, so I smiled and said hi. She said hi back. Later I remembered her and was glad I didn't ask "Do I know you?" That is a very cute story about running into the woman. I have had moments like that.